The Scuba Doctor has 232 and 300 bar Faber steel scuba cylinders for charging your airgun, air rifle, pre-charged pneumatic (PCP) air rifle and paintball cylinders/tanks/bottles at the best prices available. We recommend you use a 300 bar steel cylinder as you'll get a lot more fills (it could be something like 3 times more). But check that your local dive shop can do scuba cylinder air fills to 300 bar as some only have compressors rated to 232 bar. Using a 232 bar scuba cylinder to recharge a PCP air rifle to a target pressure of 180 bar should give you a reasonable number of fills. But if you air gun is being recharged to 220 bar, then a 232 bar scuba tank will give you very few fills. 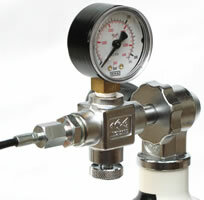 If a 300 bar scuba cylinder is used as the recharge air source then you will get plenty of fills in both cases. We have available 300 bar (4,350 psi) Faber steel scuba cylinders with 300 bar DIN valves in 3 litre, 5 litre, 7 litre and 12 litre capacity for charging air rifles. Most people use the 12 litre capacity 300 bar scuba cylinder. The 3, 5 and 7 litre cylinders are typically only used as a more portable solution where mobility counts. It's extremely rare to find 300 bar cylinders for sale second hand. The 300 bar scuba cylinders are usually connected to your air rifle using an adapter with a 300 bar male DIN fitting at one end and the fitting required for your air rifle cylinder at the other end. We do not supply these DIN 300 bar adapters. (We suggest you try Hermanns Sporting Guns.) 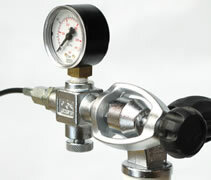 These adapters can be used with scuba cylinders using a 300 bar DIN, 200 bar DIN, or DIN/K valve. How many fills will you get from a 300 bar cylinder? Well there are so many variables that we're not prepared to say. Other owners of the setup you're using should be able to answer this much better than we could. We have available 232 bar (3,365 psi) Faber steel tanks with DIN/K valves (232 bar DIN connection with the insert removed, and Yoke connection with the insert in place) in 3 litre, 5 litre, 7 litre, 9 litre, 10.5 litre, 12.2 litre, 15 litre and 18 litre capacity for charging air guns. If you're buying a 232 bar cylinder, we suggest the 12.2 litre capacity cylinder. The 232 bar scuba cylinders are usually connected to your air gun/rifle cylinder using a Scuba Filling Yoke/A-Clamp/K-Valve Adapter for PCP Rifles with either a 1/8" BSPP thread or a Female Foster Connection. We do not supply these adapters. (We suggest you try Hermanns Sporting Guns.) These adapters can't be used safely with 300 bar scuba cylinders. Refilling the scuba cylinder is best done at a dive shop where the compressed air provided should be completely free of moisture and other contaminants. The compressed air that you pump your car tyres up with is not clean or dry enough for a PCP air rifle, and the pressure wouldn't be high enough anyway, e.g. 150 psi (10 bar) when you need 3,000+ psi (200+ bar). When charging the rifle, open the scuba cylinder valve very slowly. This will allow the air to pass along the filling hose, open the inlet valve and fill the reservoir. Only partially opening the cylinder valve will let you control the air flow. A slow fill is a good fill. Opening and closing the scuba cylinder valve quickly will give a false reading of how much air is in the gun, it can also damage the rifle. WARNING: Never use anything other than divers' quality compressed air to recharge your PCP air rifle/gun. Using gasses other than clean, dry, breathing quality compressed air can be highly dangerous and will usually invalidate air rifle warranties. Air rifles must never be filled to more than the manufacturers stated pressure, which is likely to be much lower than the pressure in the scuba cylinder. By exceeding the recommended pressure two things will happen. The first is that the power of the gun will drop significantly. It's a myth that the higher the pressure in the gun, the more power it produces. In fact you normally find that maximum power is produced about 10 bar below the maximum recommended pressure on non regulated rifles, and a 20 bar overfill can reduce the power by 40%. In order for scuba tanks to be refilled in an Australian dive shop they are required to be tested every year if they are used for diving. As a dive shop has no way to tell that you're using the cylinder exclusively out of the water, they will require the scuba cylinder to be in test before filling it. We suggest you avoid aluminium scuba cylinders as most are only rated to 207 bar. Do not buy second hand old aluminium cylinders (made of 6351 aluminium alloy, or pre 1995) as some have been known to explode and kill people. Plus you probably won't be able to get these old aluminium tanks tested, or filled at a dive shop. A full scuba cylinder contains an enormous amount of energy. They are quite robust, however, you should treat them with great care. We recommend you put a For Paintball Use Only cylinder sticker on scuba cylinders used to fill air gun and paintball cylinders.